They are link position and link volume. The “ideal” link is the first one that shows on the page, i.e. in the top fold of the page. A contextual link – placed within content, for example, within an article – will have more value than a link put in a sidebar. And a sidebar link will have more weight than a link placed in the footer of the page. As it comes to link volume, the less links on the page, the better. The value will be divided between all links – internal and external. But this is not a big concern because link volume primarily affects the PageRank and not a search engine position. In Fast Blog Finder besides the blog type (DoFollow/NoFollow), Domain PR, and Page PR you will see the number of outbound links on the page so you can decide whether the page is worth to post the comment on or not. Let’s take our “email marketing software” example I talked about in the Part I. Suppose that this is a brand new site with no existing links from other sites. You want to it to show in the top positions in Google if someone searches for “email marketing software”. If you manage to obtain, for example, 5 links from some of 30 websites that are on top positions for the “email marketing software” keyword phrase, there is a chance your website will then appear somewhere in the top 30 results in search engines for that keyword phrase. It sounds good, but it’s hard to do. Practically the only possible way to obtain such links is to purchase them on a monthly basis. But there are two concerns: 1) it’s too expensive, and 2) very few from top sites provide such an option. So, let’s put this aside and look what we can do with the type 2 and 3 links. If you manage to generate 500 links using the exact “email marketing software” term or at least some keywords as the anchor text, there is a high probability that you will achieve the same rank as if you would get 5 type 1 links. What is important to remember is that the quantity of link you’ll need to get depends on the specific term you want to rank for. The more competitive term is, the more category 3 links you’ll need. 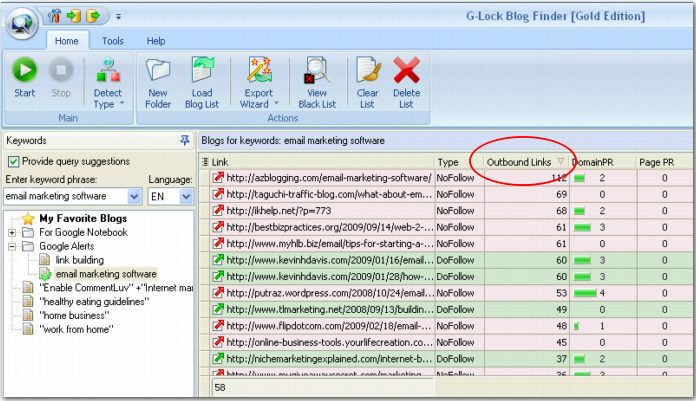 Ultimately, you’ll want to obtain links of all 3 types and not limit yourself to one specific link type only. Assume you exhausted all possibilities to get the Type 1 links and managed to rank among the top 30 results in search engines but you don’t see any further improvement. So, you need to put your efforts at building the Type 2 and 3 links in order to move your website higher. Or, here is the opposite case. You got 500 or so links of the Type 3 and your website ranks among the top 30 results for your keywords. Now you’ll find that you need several links of the Type 1 or 2 to push your site higher. I hope this article helps you better understand the value of links and their impact on your search engine rankings. While the value of the Type 1 links seems to be obvious, don’t underestimate the Type 3 links. Any link of the Type 3 is better than no link. The key in link building is to ensure you are continually working at getting more and more links. Now I'm going to share a secret with you: best links are those ones that your competitors will not be able to get. So, think about the opportunities you have in order to obtain unique back links that are not accessible to your competitors. Maybe it is related to your website content, your online business, or some other resources your competitors don't have. One great opportunity to get a lot of quality one-way links and increase your Google ranking is join MyWayLinks! I bet your competitors aren't aware of this secret method. MyWayLinks solves all of the problems of manually finding link partners and all of the problems associated with automated link networks. The links you'll get from the MyWayLinks system have great value in Google's eyes, because all of the sites linking to you have PageRank. That means they are already well-linked themselves, and Google loves to see links to your site from sites that have this kind of "authority". Here you can read more about how you can build quality one-way links to your website using MyWayLinks system.